This article is about the Dutch province. For other uses, see North Holland (disambiguation). North Holland (Dutch: Noord-Holland [ˌnoːrt ˈɦɔlɑnt] ( listen), West Frisian Dutch: Noard-Holland) is a province of the Netherlands located in the northwestern part of the country. It is situated on the North Sea, north of South Holland and Utrecht, and west of Friesland and Flevoland. In 2015, it had a population of 2,762,163 and a total area of 2,670 km2 (1,030 sq mi). From the 9th to the 16th century, the area was an integral part of the County of Holland. During this period West Friesland was incorporated. In the 17th and 18th century, the area was part of the province of Holland and commonly known as the Noorderkwartier (English: "Northern Quarter"). In 1840, the province of Holland was split into the two provinces of North Holland and South Holland. In 1855, the Haarlemmermeer was drained and turned into land. The capital and seat of the provincial government is Haarlem, and the province's largest city is the Netherlands' capital Amsterdam. The King's Commissioner of North Holland is Johan Remkes, serving since 2010. There are 51 municipalities and three (including parts of) water boards in the province. 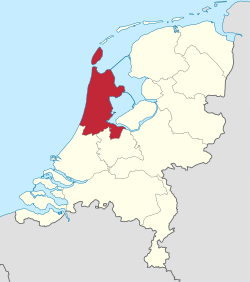 The province of North Holland as it is today has its origins in the period of French rule from 1795 to 1813. This was a time of bewildering changes to the Dutch system of provinces. In 1795, the old order was swept away and the Batavian Republic was established. In the Constitution enacted on 23 April 1798, the old borders were radically changed. The republic was reorganised into eight departments (département) with roughly equal populations. Holland was split up into five departments named "Texel", "Amstel", "Delf", "Schelde en Maas", and "Rijn". The first three of these lay within the borders of the old Holland; the latter two were made up of parts of different provinces. In 1801 the old borders were restored when the department of Holland was created. This reorganisation had been short-lived, but it gave birth to the concept of breaking up Holland and making it a less powerful province. In 1807, Holland was reorganised. This time the two departments were called "Amstelland" (corresponding to the modern province of North Holland) and "Maasland" (corresponding to the modern province of South Holland). This also did not last long. In 1810, all the Dutch provinces were integrated into the French Empire. Amstelland and Utrecht were amalgamated as the department of "Zuiderzee" (Zuyderzée in French) and Maasland was renamed "Monden van de Maas" (Bouches-de-la-Meuse in French). However, the division was not totally reversed. 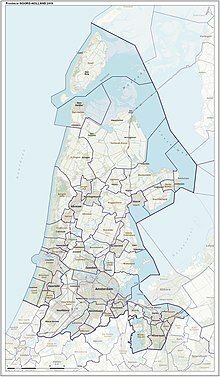 When the province of Holland was re-established in 1814, it was given two governors, one for the former department of Amstelland (area that is now North Holland) and one for the former department of Maasland (now South Holland). Even though the province had been reunited, the two areas were still being treated differently in some ways and the idea of dividing Holland remained alive. During this reorganisation the islands of Vlieland and Terschelling were returned to Holland and parts of "Hollands Brabant" (including "Land of Altena") went to North Brabant. The borders with Utrecht and Gelderland were definitively set in 1820. After the Haarlemmermeer was drained in 1855 and turned into arable land, it was made part of North Holland. In exchange, South Holland received the greater part of the municipality of Leimuiden in 1864. In 1942, the islands Vlieland and Terschelling went back to the province of Friesland. In 1950, the former island Urk was ceded to the province of Overijssel. In February 2011, North Holland, together with the provinces of Utrecht and Flevoland, showed a desire to investigate the feasibility of a merger between the three provinces. This has been positively received by the First Rutte cabinet, for the desire to create one Randstad province has already been mentioned in the coalition agreement. The province of South Holland, part of the Randstad urban area, visioned to be part of the Randstad province, and very much supportive of the idea of a merger into one province, is not named. With or without South Holland, if created, the new province would be the largest in the Netherlands in both area and population. North Holland is situated at 52°40′N 4°50′E﻿ / ﻿52.667°N 4.833°E﻿ / 52.667; 4.833 in the northwest of the Netherlands with to the northeast the province of Friesland, to the east the province of Flevoland, to the southeast the province of Utrecht, to the southwest the province of South Holland, and to the west the North Sea. North Holland is a broad peninsula for the most part, located between the North Sea, the Wadden Sea, the IJsselmeer, and the Markermeer. More than half of the province consists of reclaimed polder land situated below sea level. The West Frisian islands of Noorderhaaks and Texel are also part of the province. North Holland makes up a single region of the International Organization for Standardization world region code system, having the code ISO 3166-2:NL-NH. As of January 2019, North Holland is divided into 47 municipalities (local government). After the dissolution of the Netherlands Antilles, three islands in the Caribbean, Bonaire, Saba, and Sint Eustatius, were offered to join the province, though the offer has been neither accepted nor rejected. North Holland has five municipalities with 100,000 or more inhabitants. They are, in order of size, Amsterdam (in terms of population this is also the largest municipality in the Netherlands), Haarlem, Zaanstad, Haarlemmermeer and Alkmaar. Another seven municipalities have a population between 50,000 and 100,000 inhabitants (Hilversum, Amstelveen, Purmerend, Hoorn, Velsen, Den Helder and Heerhugowaard). On 1 January 2015 the municipalities of Graft-De Rijp and Schermer were merged into the existing municipality of Alkmaar. On 1 January 2019 the municipality Haarlemmerliede en Spaarnwoude was merged into the existing municipality of Haarlemmermeer. Map of North Holland (2019). More information about nature reserves in North Holland is available (in Dutch) on the relevant site pages of national nature conservation organisations Natuurmonumenten  and Staatsbosbeheer , as well as provincial organisation "Landschap Noord-Holland". 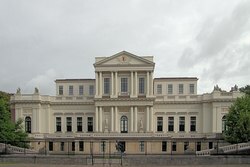 Several international organisations such as Amnesty International have settled the head office of their Netherlands branch in the province and particularly in Amsterdam; the international head office of Greenpeace is located in the city. Other companies based in the Netherlands' capital include Akzo Nobel, Heineken International, ING Group, ABN AMRO, TomTom, Delta Lloyd Group, Booking.com and Philips. Randstad Holding has its headquarters in Diemen while KPMG and KLM operate from Amstelveen. Several national nature friendly organisations like Milieudefensie, the national "Union of vegetarians", the "Vissenbescherming" (Fish protection foundation) and the Party for the Animals as well have their head office in North Holland. ^ (in Dutch) Noord-Hollands volkslied, Province of North Holland. Retrieved on 19 Januari 2019. ^ "Regionale kerncijfers Nederland" (in Dutch). CBS. Retrieved 30 May 2015. ^ (in Dutch) "Drie provincies denken over fusie", NOS, 2011. ^ (in Dutch) "Randstadprovincies bekijken fusie", RTL Nieuws, 2011. ^ (in Dutch) Marije Willems, "Randstadprovincies onderzoeken fusie", NRC Handelsblad, 2011. ^ (in Dutch) "Echte Randstadprovincie is robuuste oplossing" Archived 24 July 2011 at the Wayback Machine, Provincie Zuid-Holland, 2011. ^ "The ports of IJmuiden; History; Fishing port; The fish auction; Cup port; Seaport Marina". feelingkeep.com. Retrieved 18 January 2018. ^ World Heritage. "Visiting the Kop van Noord-Holland". Wadden Sea World Heritage. Retrieved 11 October 2017. ^ DK Eyewitness Travel Guide: The Netherlands. Penguin. 2011. p. 169. ISBN 9780756684761. ^ Bertolini, Luca (10 January 2013). "Transitions of Mobility Systems in Urban Regions: A Heuristic Framework". Journal of Environmental Policy & Planning. 15 (2): 141–160. doi:10.1080/1523908X.2012.746182. ^ "Natuurgebieden in Noord-Holland". Natuurmonumenten. ^ Amnesty International, Amsterdam address. ^ Work for Greenpeace, official website. ^ Randstad address in Diemen. ^ Vegetariersbond. "De Vegetariërsbond - Vegetariersbond". vegetariers.nl. Wikimedia Commons has media related to North Holland.